As many of my readers in the United States might be aware, June of every year is commonly held to be Pride Month, in the same way that February is African American History Month. This a month when the now famous Pride Parades (which started out as riots) are held, along with any number of LGBTQ-oriented events: cookouts and parties, memorials and commemoration services, as well as any number of workplace events, such as how to understand and cope with LGBTQ diversity and the like. I recently attended such a seminar in my own office, organized by the District of Columbia’s Office of GLBT Affairs, which was awesome. There was little new information to me, seeing that I’m more versed in the legal miasma that affects the demographic I fall into, but it was helpful all the same. Now, I work for the United States federal government. At the time of this writing, the federal government does not yet have a nondiscrimination law that encompasses sexual orientation (LGB) or gender identity/expression (TQ, sometimes I), though certain branches of the government include this in their own branch-specific manner. My own branch, for instance, prohibits discrimination based on sexual orientation or gender identity/expression, which is awesome, because it’s one fewer thing I can be fired for. And, despite what you may think, many states and localities still don’t yet have their own employment nondiscrimination acts (ENDAs), so in many parts of the US, I can still be fired, not hired, or denied a promotion for being who and what I am. I’m glad I can work where I am openly and freely, but not everyone is aware of the rights and restrictions on LGBTQ people. It wasn’t a large seminar, and about half the people in attendance were supervisors or other employees in some managerial position. One of the more important bits of discussion we had was on the topic of homophobia (fear and intolerance of non-normative sexual orientations) and transphobia (ditto but for people with non-normative gender identity or expression). Equal Employment Opportunity (EEO) offices have to deal with this more and more as more people feel confident and safe enough to report harassment fueled by homophobia and transphobia, but it can sometimes be a sticky situation for managers and EEO personnel. Sadly, the topic was cut off due to time constraints and we had to move onto other topics, but it did bring up important aspects of how to respect the needs of LGBTQ employees. Specifically, how should we balance the needs of LGBTQ employees with those of religious employees? In many ENDAs, religion is a protected attribute that one cannot be penalized for; I cannot fire you, not hire you, deny you a promotion, or cause a hostile work environment against you due to your exercise and practice of religion or the lack thereof. In my office, the same thing goes for your sexual orientation or gender identity/expression. However, due to the ever-increasing polarization and social aggression between certain (by no means all!) religious groups and people and those who identify as LGBTQ, supervisors sometimes feel the need to balance the needs of both groups and see if there’s any middle ground to take. After all, we have freedom of speech and of religion as enshrined in our Constitution, so it’s not fair to penalize someone for their speech or views as promoted by someone’s religion, nor is it fair to penalize someone for their sexual orientation or gender identity/expression. Don’t get me wrong: I hold the free exercise of religion and the lack thereof to be one of the most important fundamental concepts required for a democracy or civilized community on any level, and interfering with that is chipping away at a society that can peacefully coexist as a societal unit. If you want to worship Christ as the Son of God, do so; if you want to worship God by honoring his prophet Muhammad, do so; if you want to venerate the Flying Spaghetti Monster, do so. I will never tell you what to worship or practice, or how to worship or practice. That, however, is not the point of the talk. While I understand the need to live a prayerful, worshipful, religious life, unless you live as a monk, you need to balance it with the life you live outside your scripture and outside your prayer room. This isn’t to say you should compromise your religion by societal needs and expectations, but that you need to pick where in society you should go based on how you choose to practice (or not practice) religion. If your social agreements and contracts conflict with your religious covenant and commitments, and if you’re not willing to change one, you need to change the other. When you work in a public capacity that serves the public and makes use of public resources, either as an employee or a business owner, you are bound to serve the public in whatever way the public needs. If you cannot fulfill those needs due to your private beliefs, then you should not work to serve them since you’re unable to serve them. 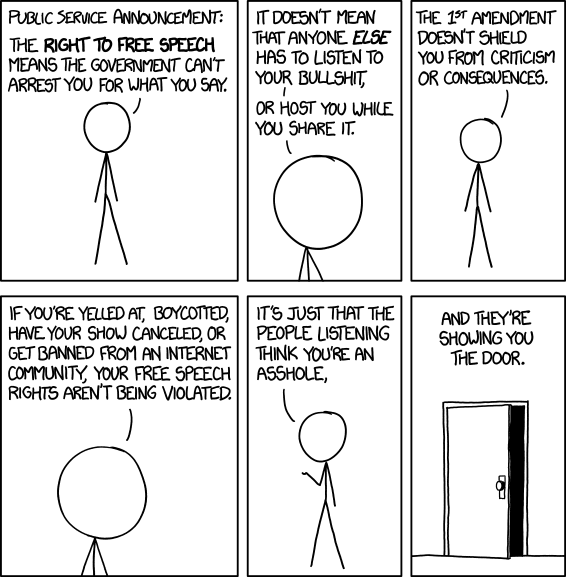 You have freedom of speech, but not freedom from your own speech; what you say and do are going to have consequences, and if your speech leads to harm and hostility in the public, you’re going to have to exercise your freedom of speech elsewhere. Consider a hypothetical (at least in my case) situation where an out queer person (in any sense) works under a rather evangelical team leader. The team leader refuses to meet one-on-one with the queer person or give them work fitting for their capacity and capability, and the team leader has dropped repeated comments about saving the soul of the queer person, how the queer person can find grace if only they would convert to being straight and normative, and the like. The evangelical person feels like that’s their religious duty, after all, and they cannot be penalized for having that religious duty, but the queer employee also has the right to a non-hostile work environment. If the evangelical person finds that their duty is motivated by scripture, and they cannot reconcile that with leaving the queer employee alone, then they cannot maintain a non-hostile work environment and is obligated to leave. To me, it’s that simple. Compare that with the recent drama about the cake bakery over in Colorado who was sued by a gay couple who wanted them to make them a wedding cake. The owners of the bakery felt that their religion prevented them from supporting gay marriage in any way, and that includes making a cake for a gay wedding. The gay coupled sued for discrimination and won, and rightly so, since this had violated Colorado’s anti-discrimination clause, which prohibits business from discriminating against its customers based on sexual orientation. Many evangelicals and those on the homophobic far right feel that this state law discriminates against religious freedom, but it doesn’t. You can practice whatever you want, but if you operate in a public capacity, you have to abide by public respect and law for those who don’t follow what you follow, or believe what you believe. That bakery was open to the public, made use of public resources (roads, etc. ), and received public assistant (tax breaks, etc.). If they were privately owned or open only to people who paid a membership fee where the members had to agree to the bakery’s terms, then they could do whatever they want and would no longer be a public service; as it was, they were open to the public and could not discriminate against the public by means of sexual orientation. Compare that, further, with the notion of certain pharmacologists and pharmacy employees who refuse to sell Plan B or contraceptive medicine to those who need it because they’re anti-abortion. They feel that, by selling these drugs to people who got pregnant early on but want to prevent pregnancy, they’re encouraging abortion and promiscuity, which they find offensive. However, as a medical professional, they’re obligated to help those who need it in the way the patient determines, and if that’s through the use of an emergency contraceptive, it’s not their place to deny them that without a legitimate medical reason. In nearly all these cases, the only reason is religious, which is not a strong enough basis to deny someone this medical coverage and assistance when it’s not illegal and when they’re entitled to it. If a pharmacologist cannot prescribe certain medicines to the public because their religion says so, then they should not be a pharmacologist serving the public. Simple as that. Your religion can be whatever you want it to be or not be. It’s really up to you. But when you interact with other people, you have to understand how to interact with people in a way that neither violates their sanctity of life nor human rights, nor in a way that violates your own religious beliefs. You can’t have it both ways. If you work in the public, you have to deal with the public, and if your religion prevents you from dealing with the public in certain ways and your job expects you to deal with the public in those same ways, you either need to change your religion or change your job. Your beliefs are an onus on you, not on me, and your beliefs should not affect me if I don’t want them to affect me. The moment they do, we have a problem, and it’s up to you to fix it or have it fixed for you. The only balance that needs to be struck is that which preserves the freedom of religion and speech for everyone, and if your religion and speech is trying to impede the freedom of others, then your religion and speech will be shown the door. You can still say the things you want to say, but nobody has to listen to it; you can still worship how you want to worship, but nobody has to be affected by it. This applies to all of us, not just to evangelical Christians who want to turn every country into a Dominionist theocracy. Many of us in occulture are bound to certain rules and regulations of behavior, sometimes instituted by our traditions, sometimes directly from our gods. For the vast majority of us, we cannot live in a world where we’re recluses who focus solely on our spiritual path; we have a world to live in and interact with, and all the people, events, and drama that goes on in it. If we find ourselves in a situation where we’re faced with breaking a greater law and a lesser law, we need to avoid breaking the greater law at the expense of the lesser law or simply abort the situation we’re in and find a way out as gracefully as we can. Getting involved in situations that would cause you to deny your spirituality or gods is a lack of forethought, but sometimes it happens, and when it does, you need to make a choice as to whether you can please your gods while upholding the laws of the situation, whether pleasing your gods is worth it, and whether you need to continue denying your gods to continue another path in the world. Learning to walk between the worlds in the sense of balancing your spiritual and mundane lives is a crucial lesson we all have to learn. You can’t always have it both ways. This has been a PSA. Now, back to magic.